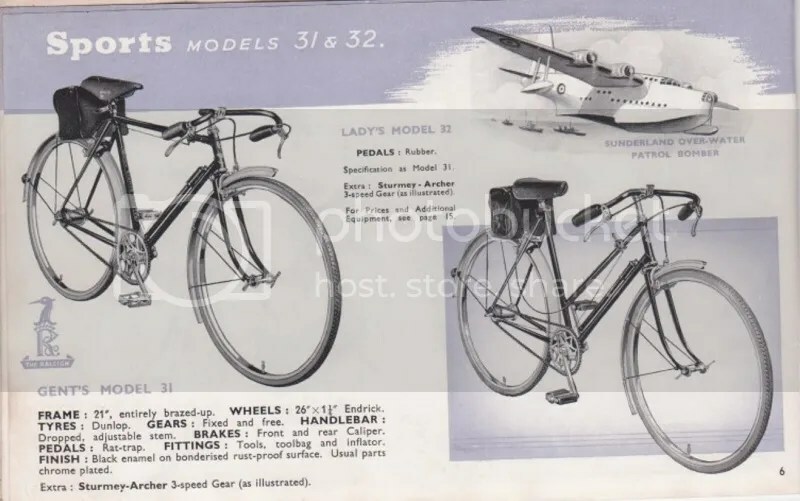 Raleigh Sports Model C.1939-1942 – Please stop eBay! A couple of weeks ago a new hit popped up on my Raleigh Blue Streak search on eBay. 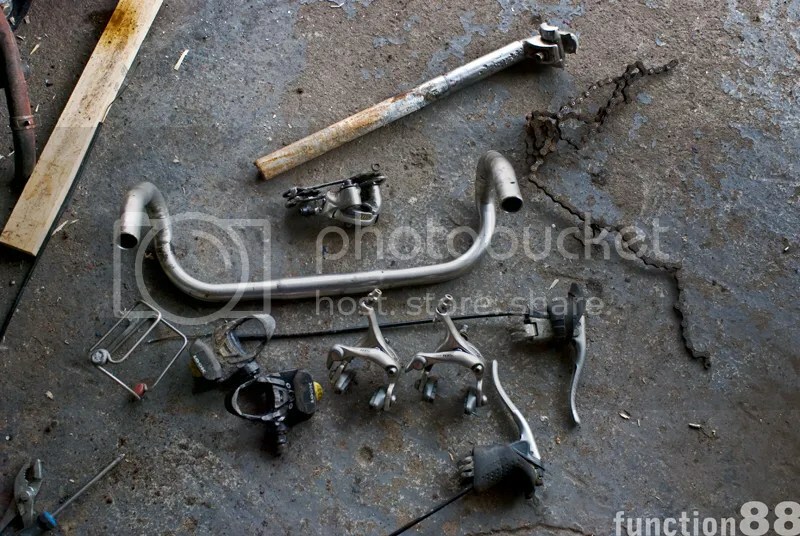 I have 95% of the parts I need and nothing I actually needed was listed. 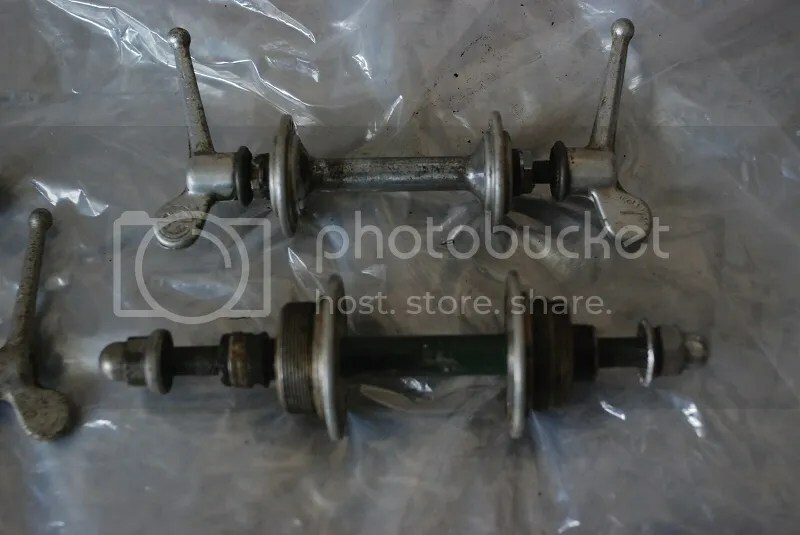 However, the results that came up showed a crank set in better condition than the one I already have and the price wasn’t too bad either so I waited, bid and won. 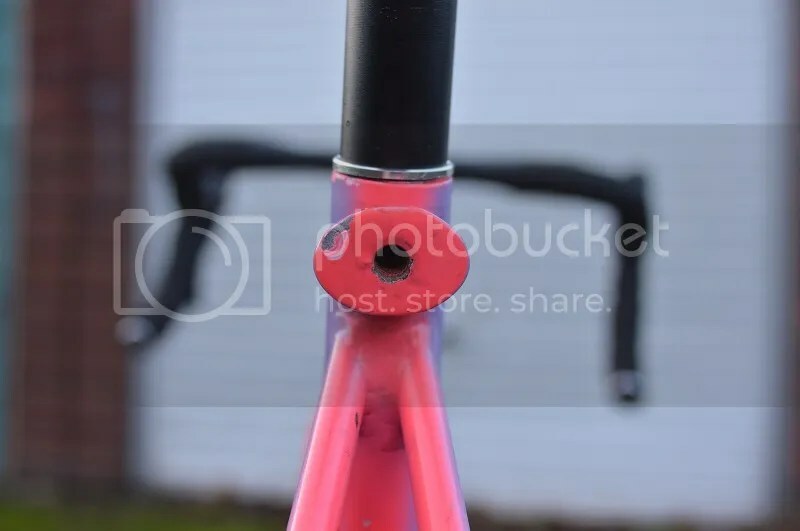 After checking out the sellers other items I ended up with a few more parts and one of them being this frame set. At first I thought I’d just add it to my watch list. 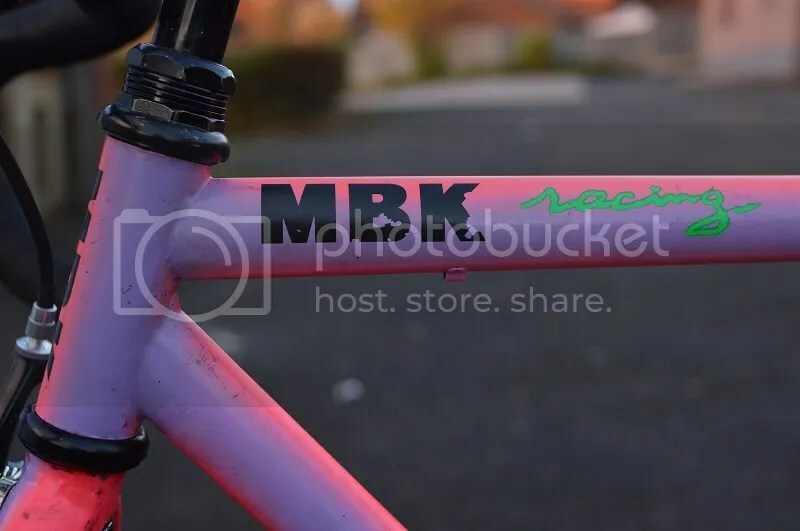 It sat there for a bit and then I decided to ask the seller how much he’d accept for the frame and for a hub I wanted for another build. I thought it was a fair price so I agreed to buy it. I picked it up on Sunday morning. The chap I bought it off seems to have exactly the same addiction as me. 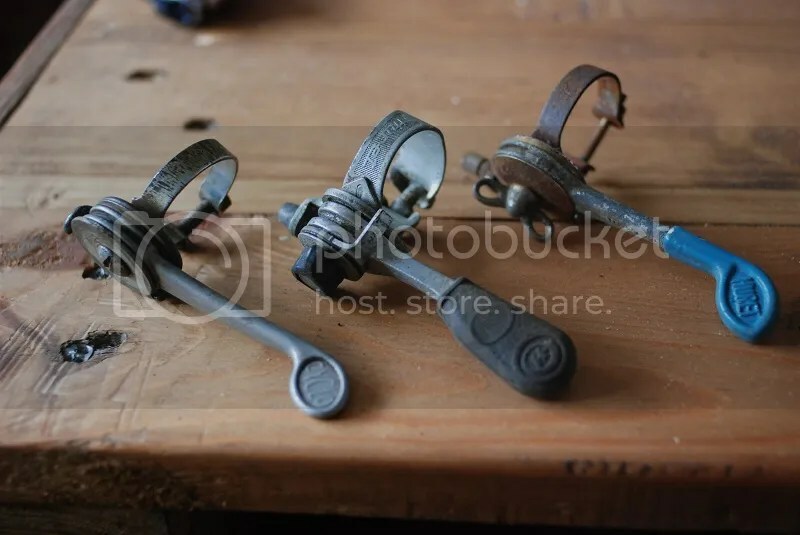 In the kitchen was his freshly built 30’s path racer and outside in the garden and in the sheds were multiple bikes and bike parts… I’m pretty sure he also said there were some in the loft. 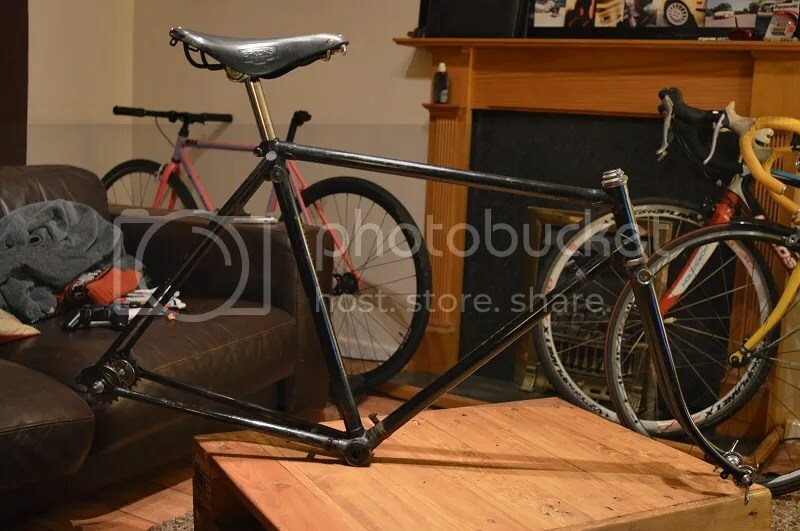 We spoke for a bit about the bikes and apart from getting this nice frame I’ve always made a new contact for parts… missing out the eBay middle man. So the frame. It hails from the beginning of World War 2. 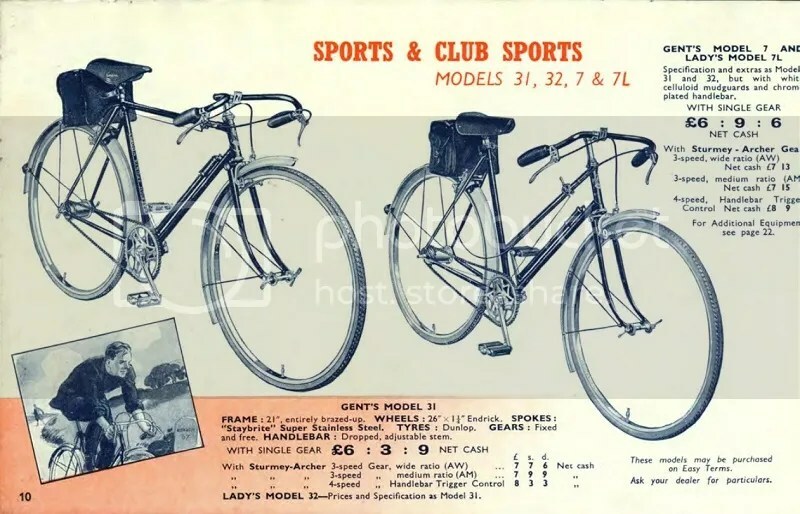 The Sports Model preceeds the start of war but in those earlier catalogues the bike is clearly shown with a coloured head tube. 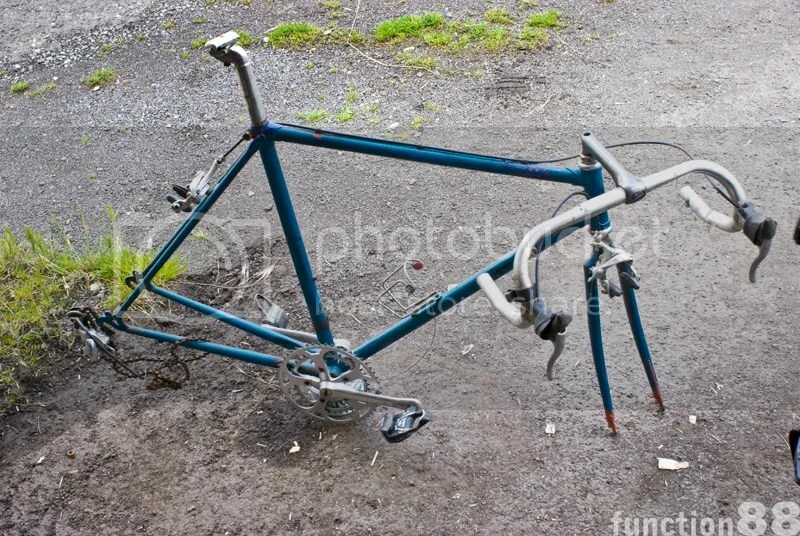 Despite the name “Raleigh Sports Model”, the frame carries a lot of weight! 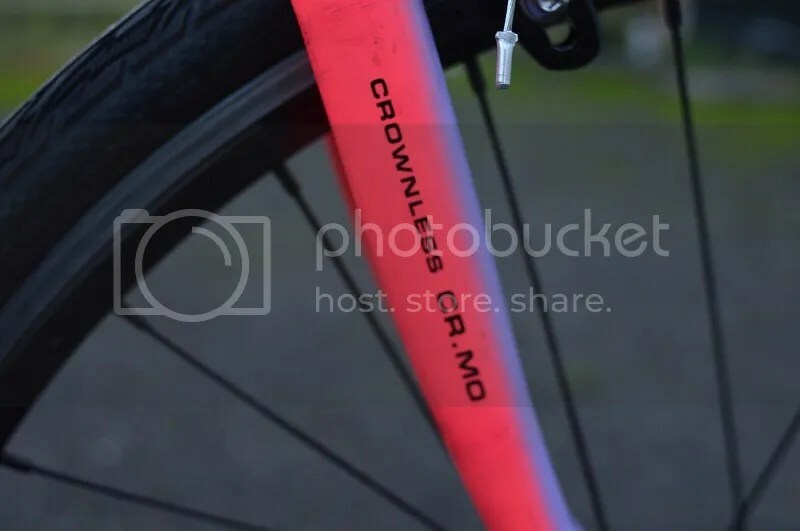 Thick, heavy tubing with no fancy lugs. Climbing hills will be fun. The frame still has all the original paint/enamel on it and despite a few rust patches it’s in really good condition, so much so that I’m thinking of just polishing the frame and applying a clear coat to preserve the originality. 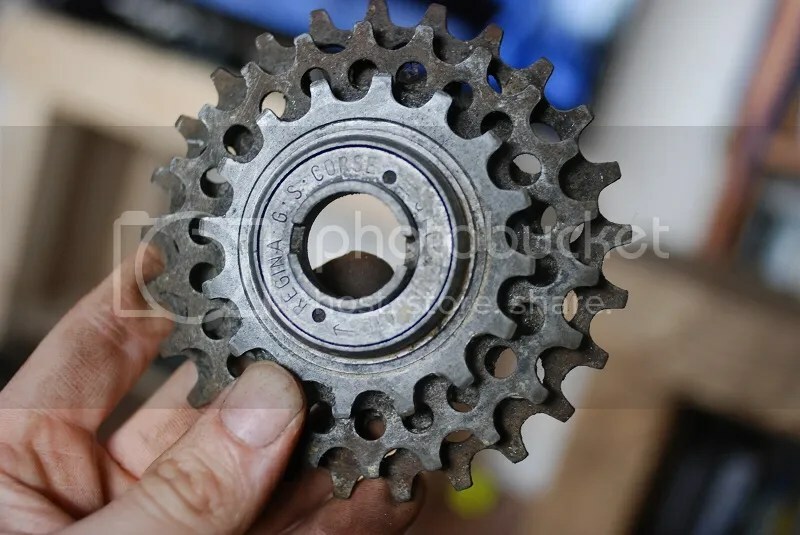 As with most old Raleigh’s the “standard” gearing was a fixed / freewheel hub with optional Sturmey Archer. 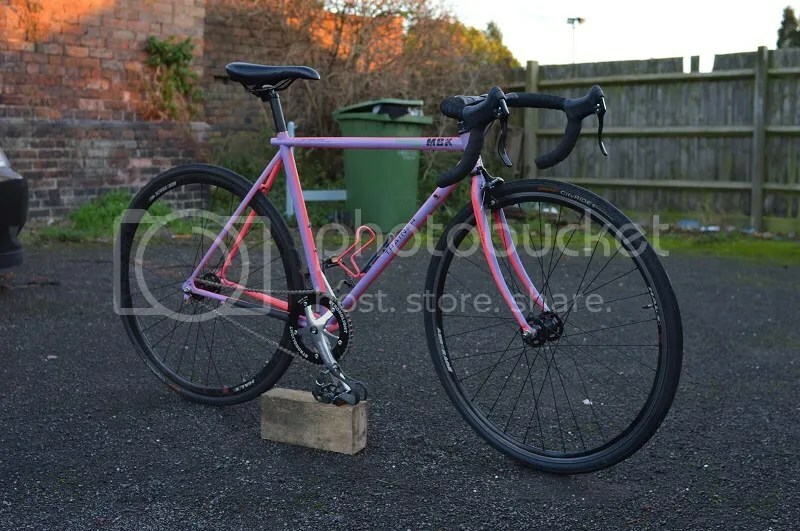 It seems the bike did indeed get the Sturmey Archer treatment but I’m going for the fixed / singlespeed option. 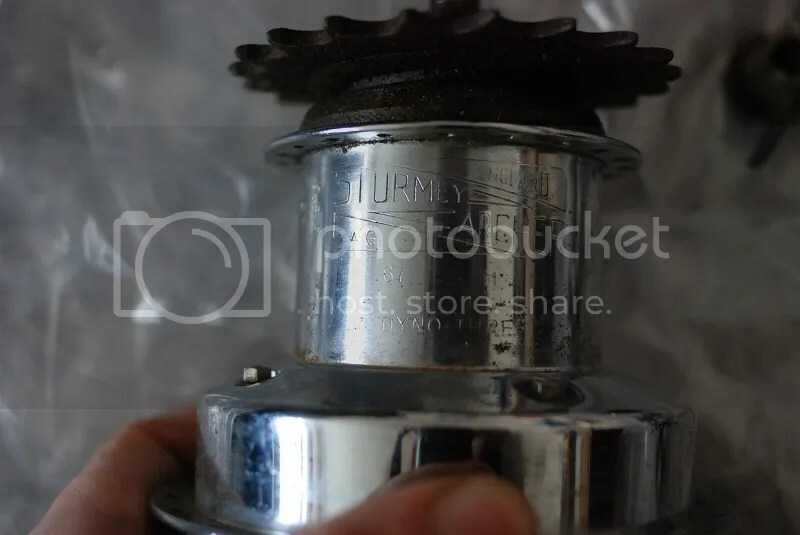 I already have a Baylis-Wiley front hub which fits perfectly along with a set of peroid Raleigh wing nuts. 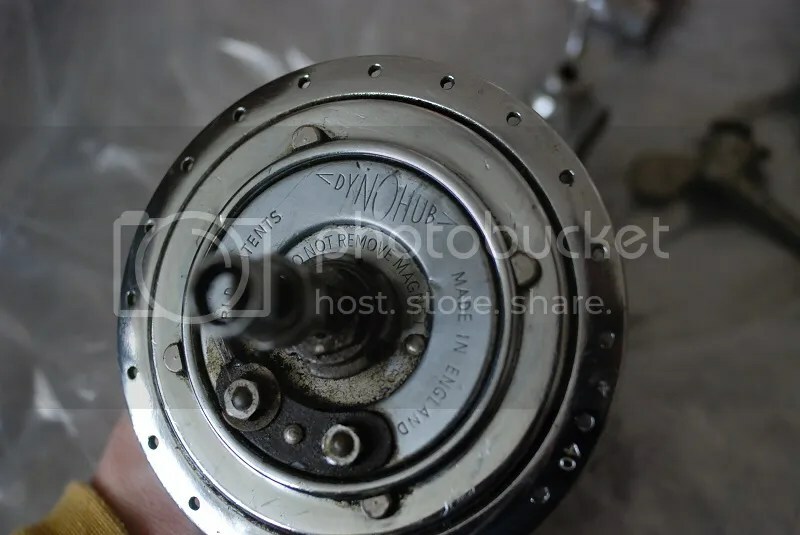 I also have a British Hub Company rear hub that suits both the frame and the fixed / freewheel standards. 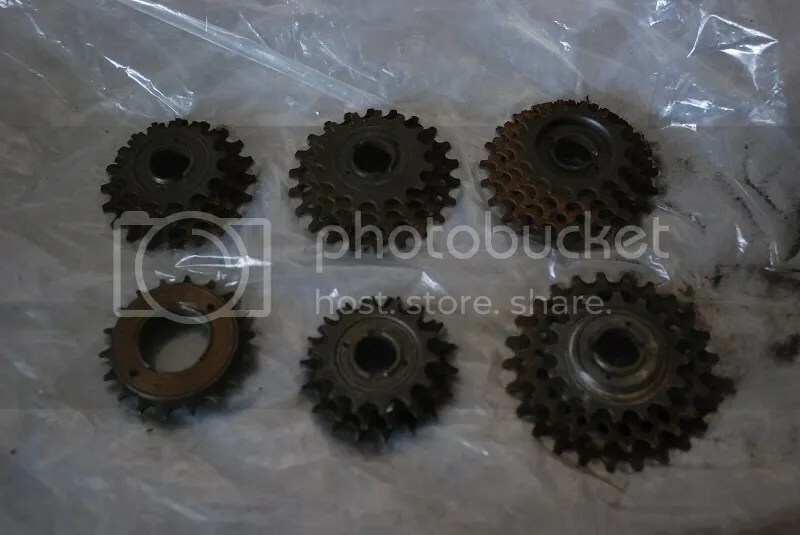 Digging through my boxes I’ve found a set of fixed cogs that I can fit and a nice Phillips freewheel. 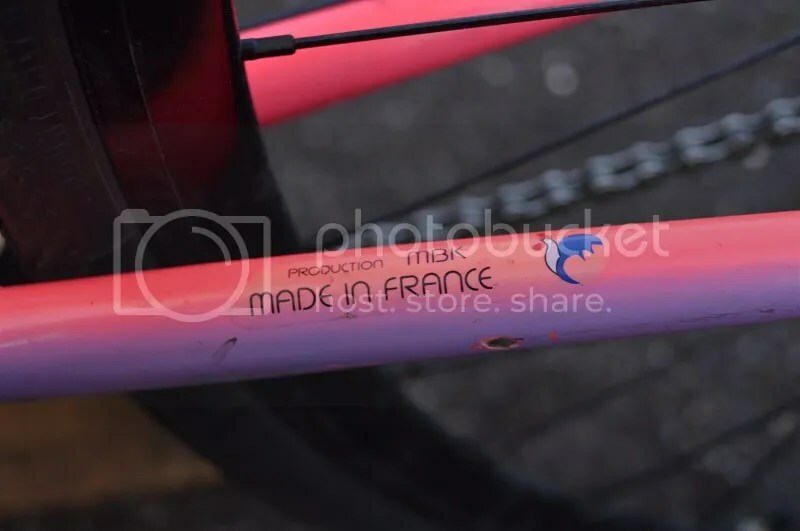 You’ll notice the Brooks saddle too. That’s come from my “old” fixed gear (it’s been relegated after bending the frame). It’s not period correct but it suits the bike. 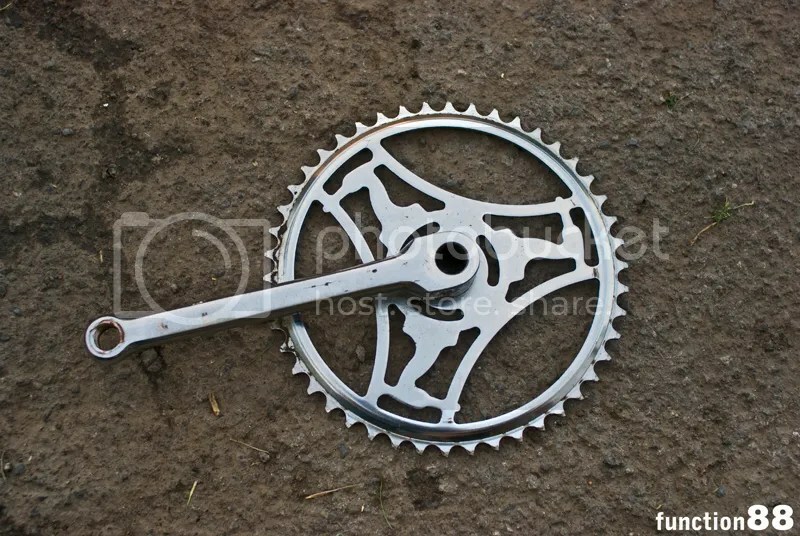 As for the other parts, I think I have a set of brakes that will fit, along with the crankset and handlebars. The rims are going to be the hardest thing to find! 26 x 1 1/4″ are rare, so very rare and finding ones in good condition for a reasonable price is even harder. I do have other options but I’d like to stick with the original wheel size if possible. 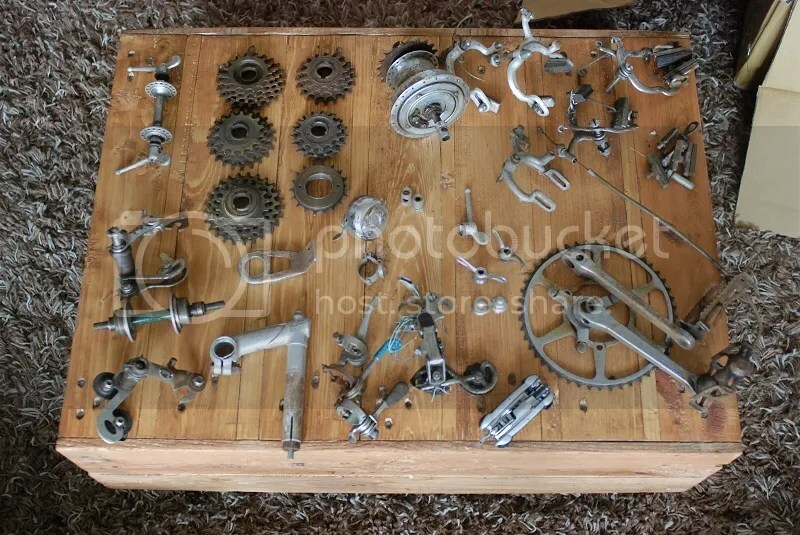 I’m in no rush to get this bike built. This is another one for my own collection so it will be on the back burner for a while. Still, what do you think? 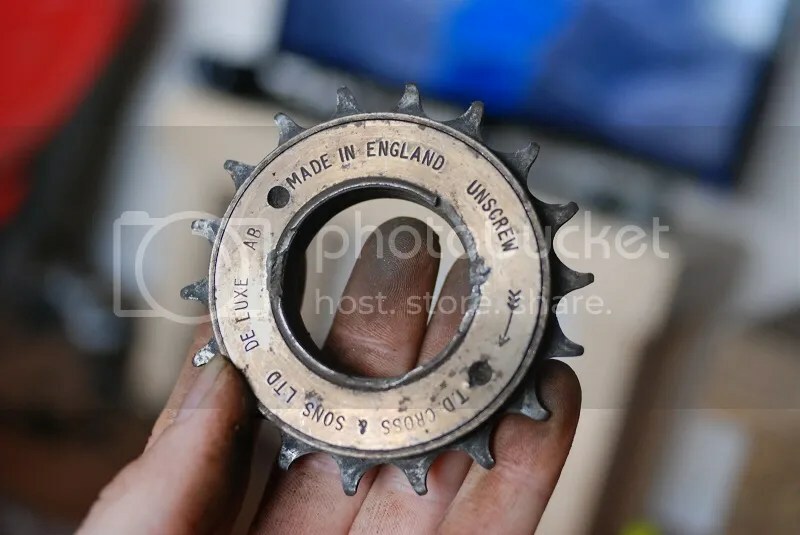 A part of British cycling history. I was getting all ready to write out a nice post about my plans to change the design of my fixie. It’s coming close to the 1000 mile mark so I thought it’s only right to spruce the old girl up a bit. In the first few hundred miles the bike got beat up quite a bit, trying to fine tune the chain tension etc. A respray is long overdue but I also wanted to change the style of all the components. I wanted to flip things around. The light frame would go dark and the dark components would go light. Essentially I was going for a black and chrome look. It would look a little more “period” than it does currently. 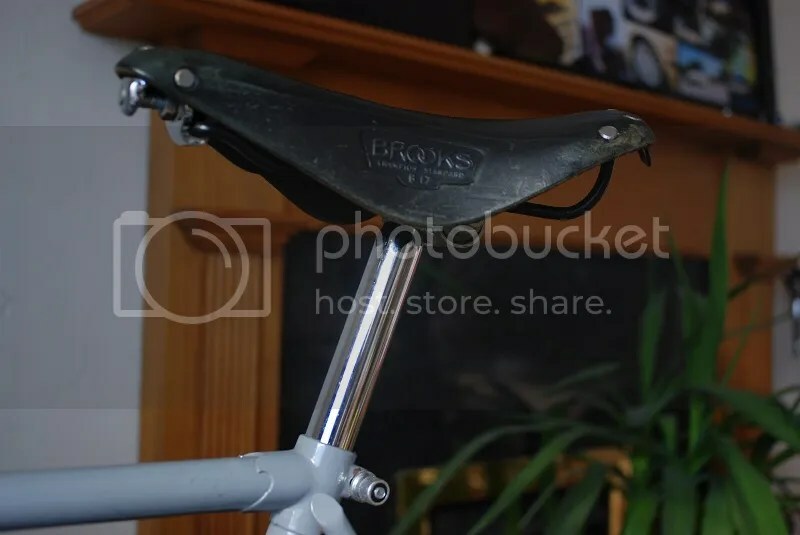 This, of course, meant buying a Brooks saddle and a chrome seat post to start with. I opted for a B17 model in black. I got it for a good price and it’s in pretty good condition. 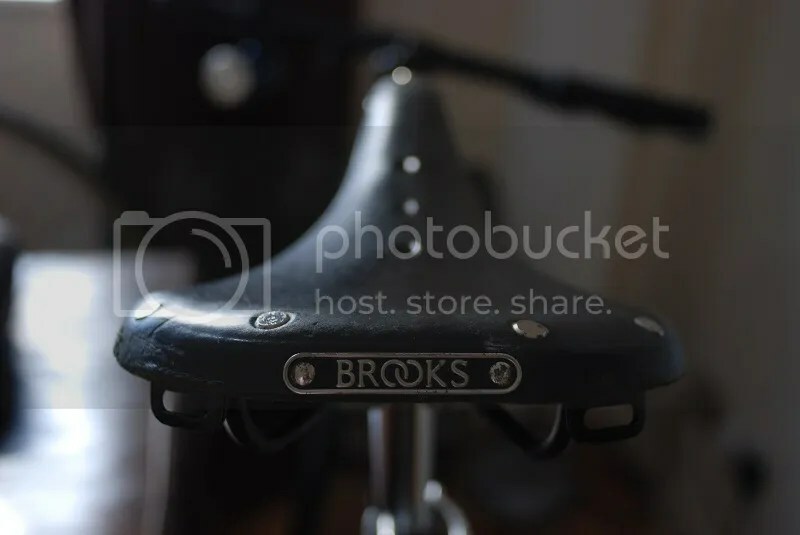 I rode with it on Friday and I can safely say it’s just as comfy and supportive as all the other Brooks saddles I’ve ridden. 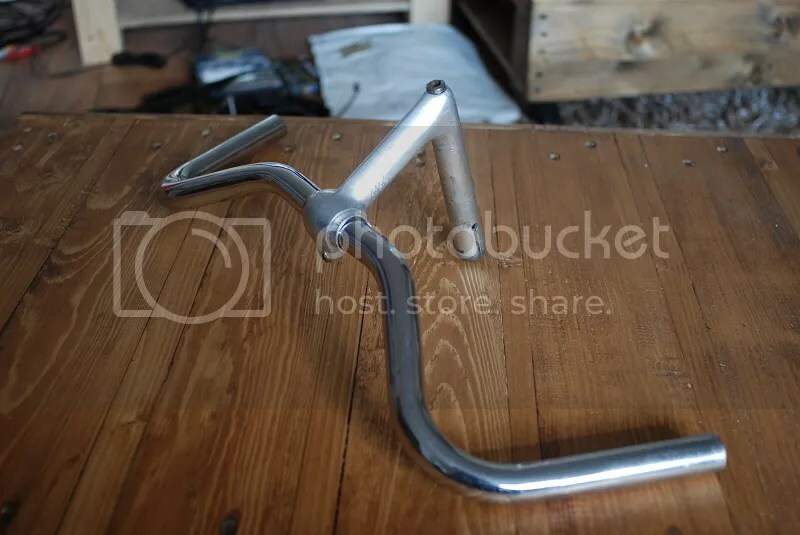 The next buys were a new set of bars and a new stem. 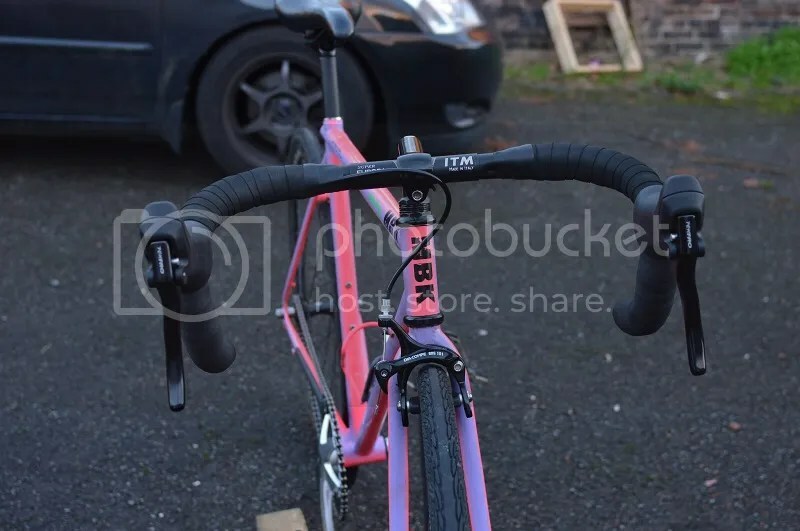 I didn’t want flat bars anymore and I didn’t want the tradition drop bar, although I would have gone for the sleek sloping style that are on the France Sport if I could have afforded a pair… Instead I went for a set of “North” bars (or at least that’s what I’ve seen them called). 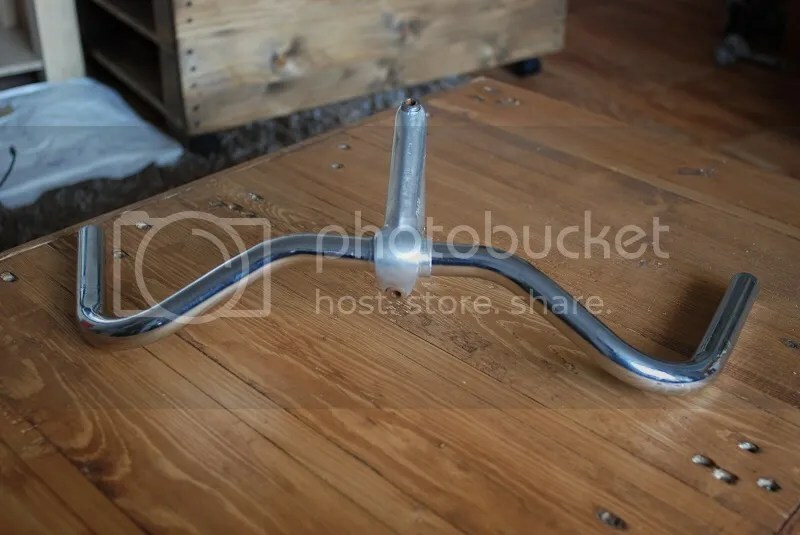 I think they’re meant to be used as riser bars for town bikes but instead I’m mounting them upside down so there is a very slight drop. 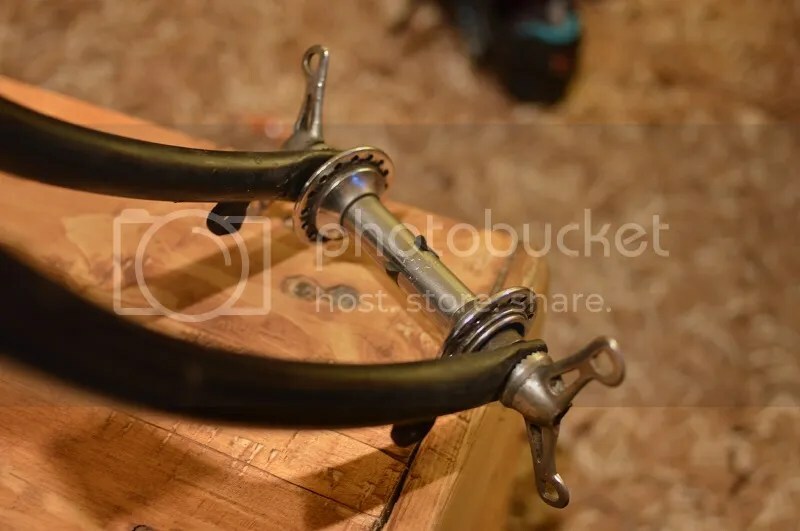 They’ll be wrapped in a black cloth tape and fitted with a matching period brake lever. 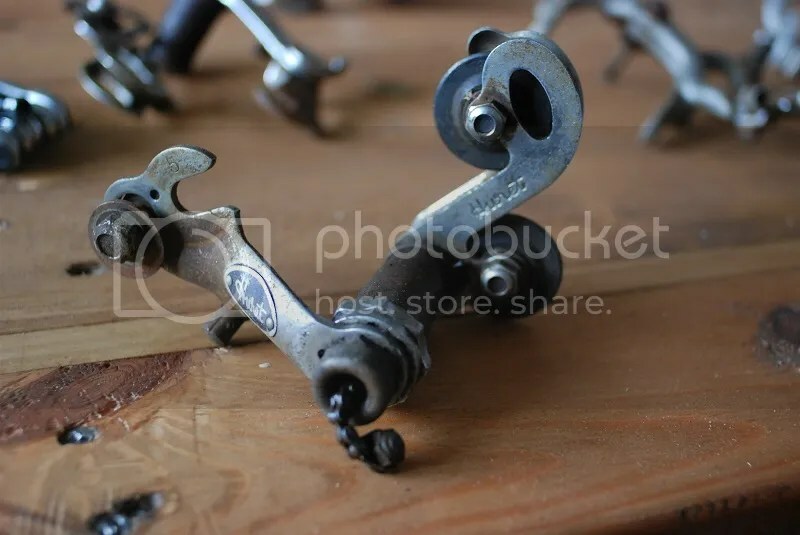 Stem wise, I wanted to go back to chrome or polished alloy. 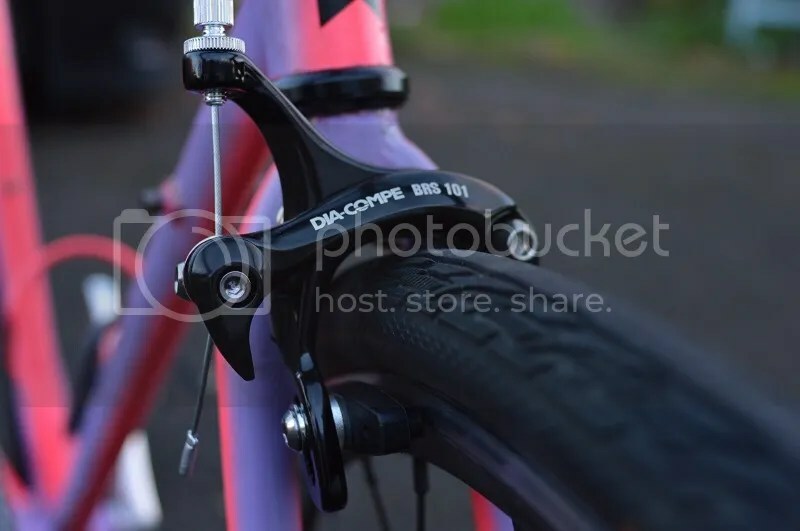 I still have the original SR stem from the bike but it only has a 60mm reach and I feel comfortable with a bit more. 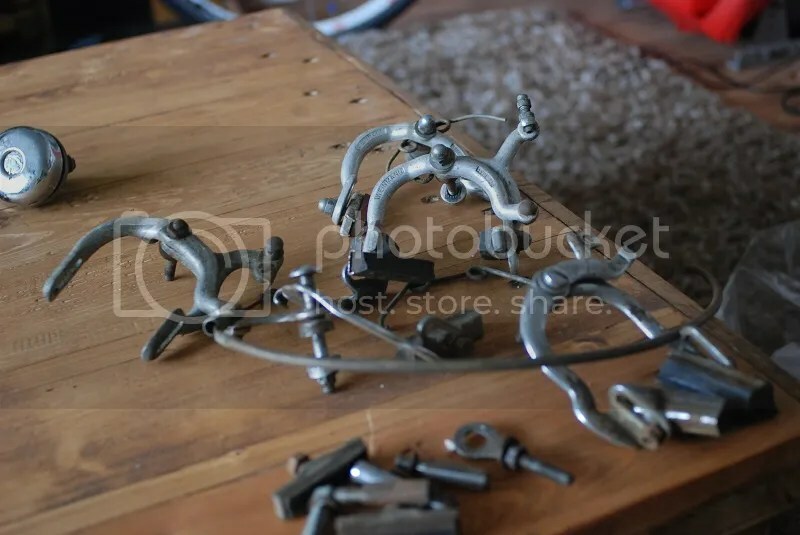 My searches on eBay threw up lot of choices, too many choices, but I found myself leaning towards the alloy stems with a “sleek” design. 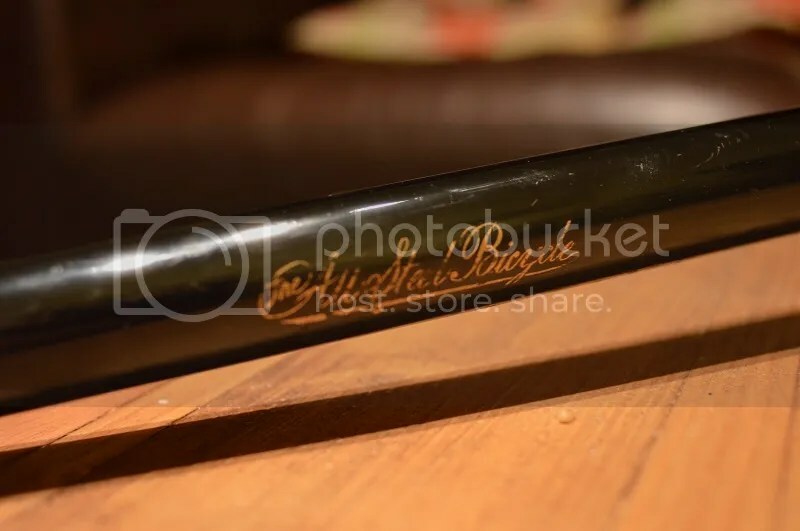 On my watch list was a renovated “Biba” stem which was beautifully polished, however as £40 it was quite pricey. 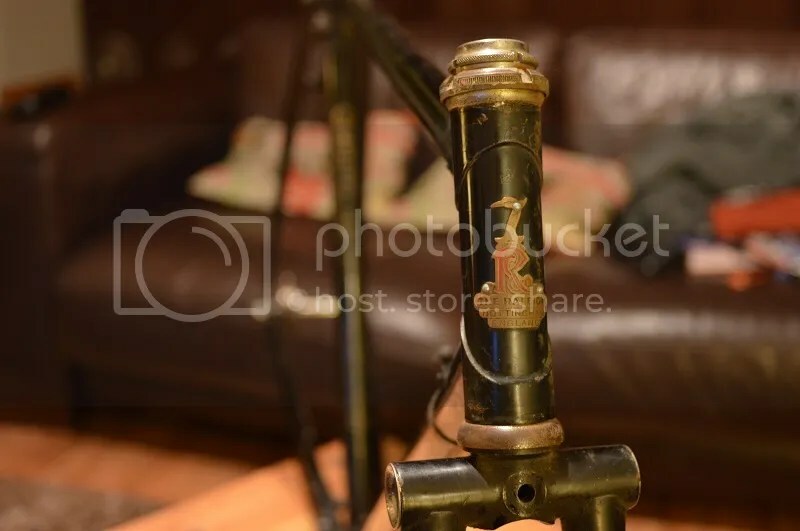 I kept looking and to my surprise another “Biba” stem popped up under the title “Unusual British Made Stem”. 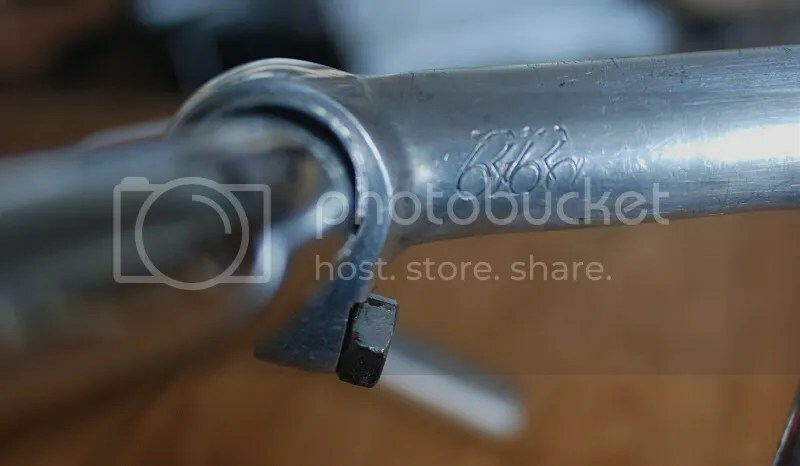 The seller had noted the two cyclists in the logo but hadn’t seen they also spelt “biba”. It was only £10 so I bought it without waiting. It’s needs a slight polish but it’s exactly what I was looking for. 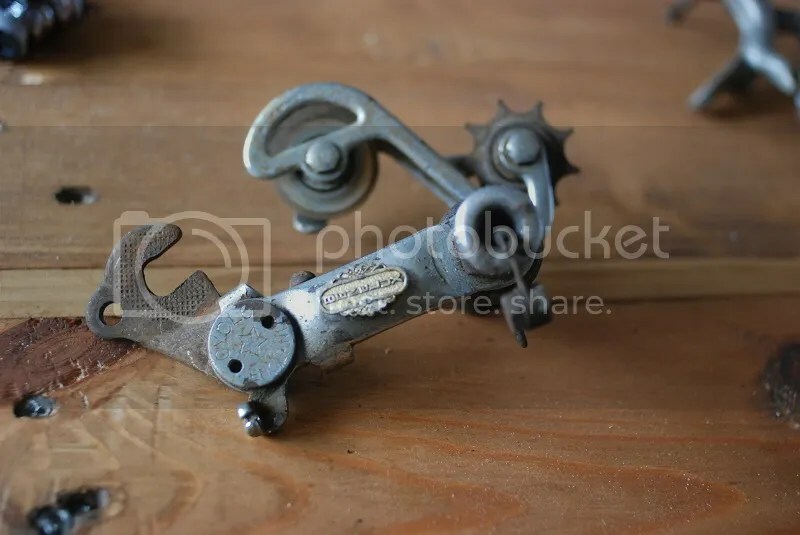 As for the next steps I’m hoping to get my hands on a “Rudge” crank set because I love the hand design and possibly some new pedals. 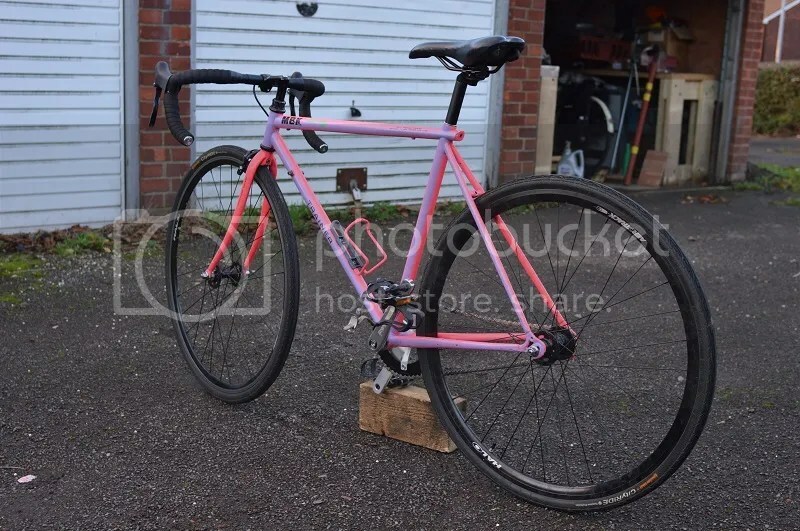 The frame will be stripped and repainted a gloss black and the bike will be good for another 1000 miles. Well… actually that’s all just a “wish” at the moment. I had a slight accident on Friday riding to work. 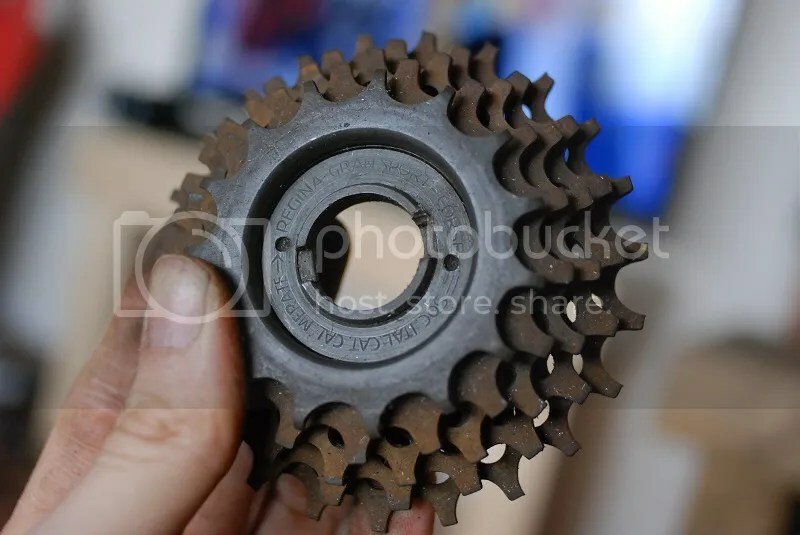 While trying to flip my non drive side pedal, without hitting any form of pot hole, my chain jumped off the sprocket, wrapped itself around the hub, locking and pulling the rear wheel out of alignment in the drop outs. This was at around 20mph, possibly more and was quite a violent motion. 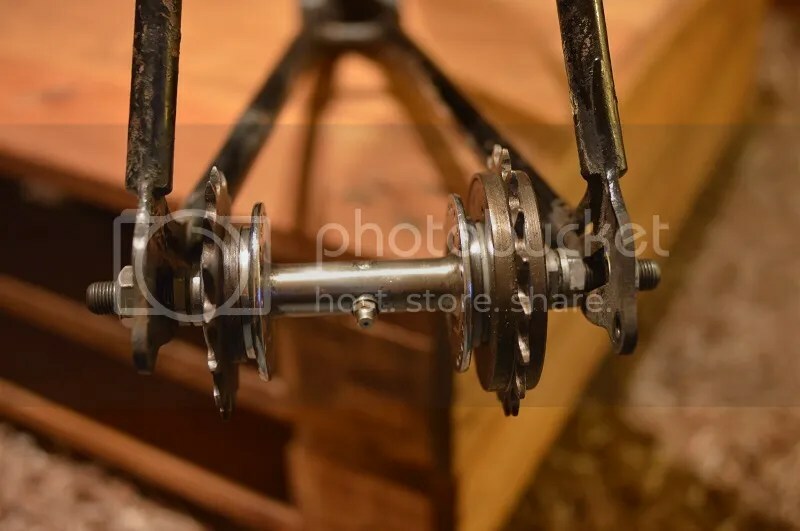 I skidded to a stop, realigned the wheel and tensioned the chain and rode on. Something didn’t feel right though. When I got to work I checked the bike over and noticed something that concerned me. 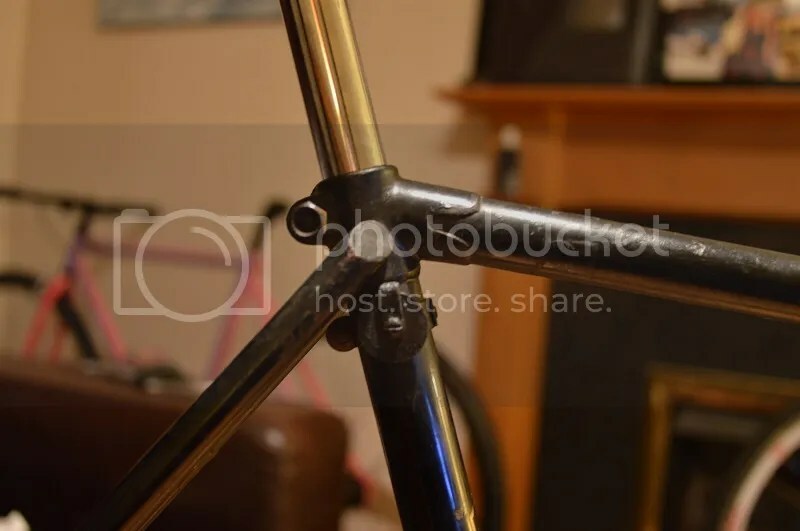 Looking at the bike from the rear, aligning my sight down the seat tube and head tube, shows the rear wheel has a lean to the non drive side and it also seems the rear triangle is now bent slightly too. It sucked a little bit having to ride to work no matter the weather but mixing it up with the traffic is always fun. So slow on the fixie though, so slow. It’s been a while but I’ve made a new edit. With all my injuries healed and the car off the road I’ve been using the bikes to get around. This edit is from 5 days of cycling to work and back. I have two GoPros now too so I can film front and rear. 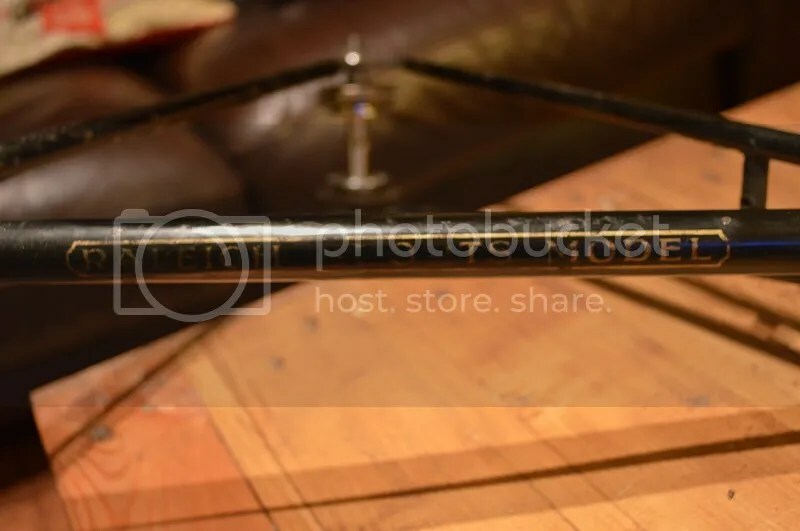 It’s pretty tricky to get the two clips lined up but I like the all round view it gives. I actually have four bikes up and running now so I’ve tried to include them all in this one. 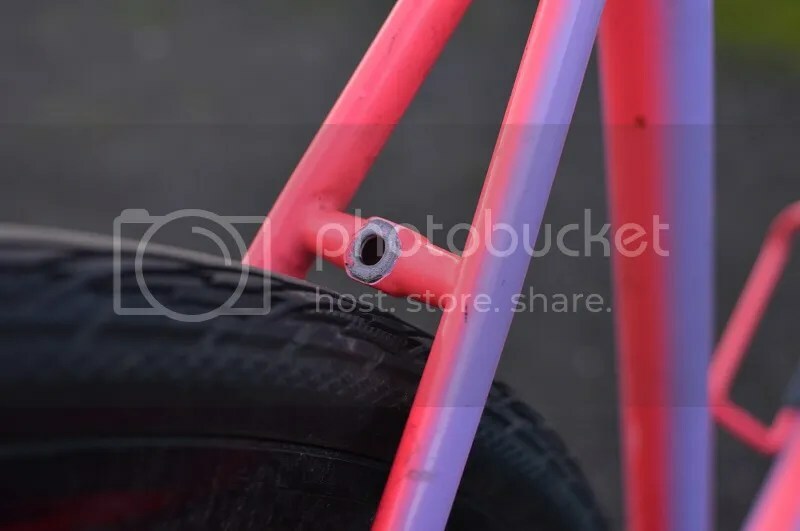 It seems like every post I make about my fixed gear build is one saying I’ve fixed it again after something went wrong. Hopefully, this will be the last one! 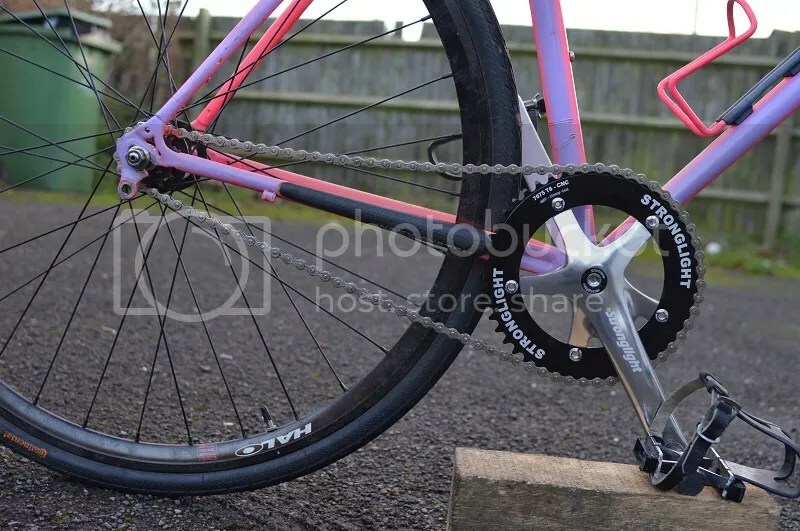 On its last outing, after the last fix of bending the chain ring back into shape, I had constant problems with the chain popping off and flexing. 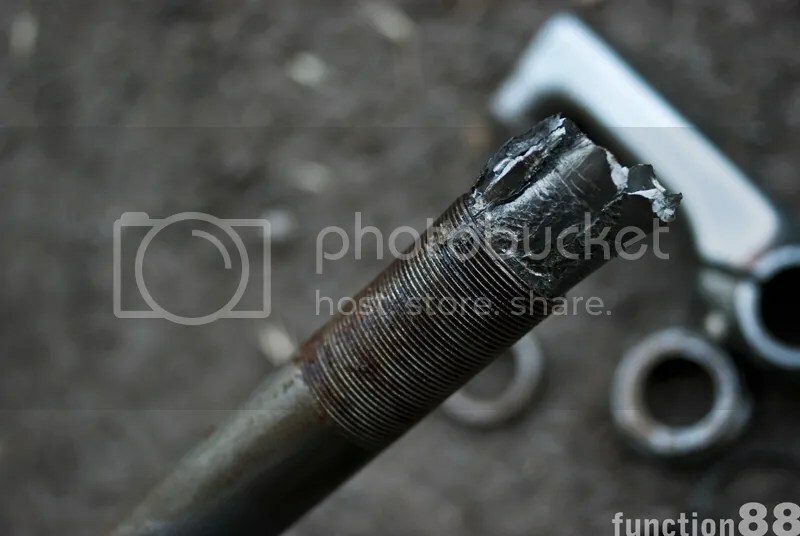 I figured it was down to the damage caused before, but also that I’m using the smaller chain ring of the original double set so it’ll never be as strong as the solid outer ring. I wasn’t entirely sure what to do until I started buying a few bikes to do up. A solution presented itself when looking over the new bikes. 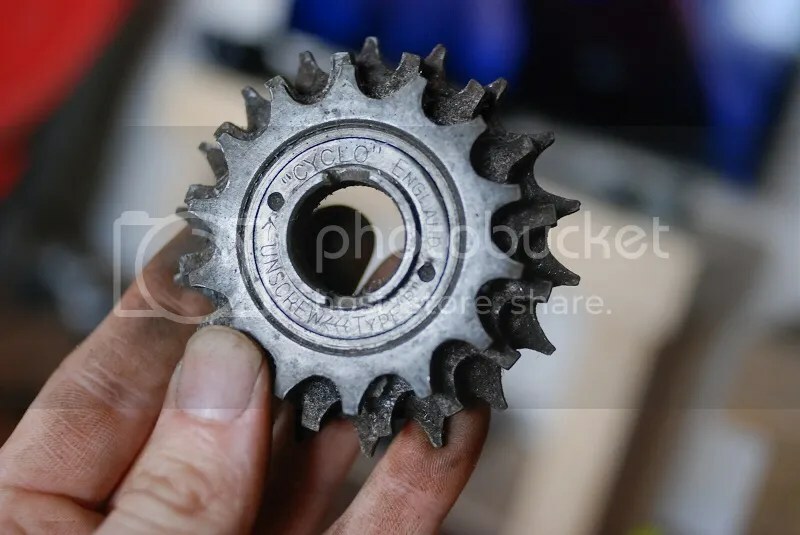 They’re all old three speed bikes, with one single speed ring up front and the three gears inside the Sturmey Archer hub. 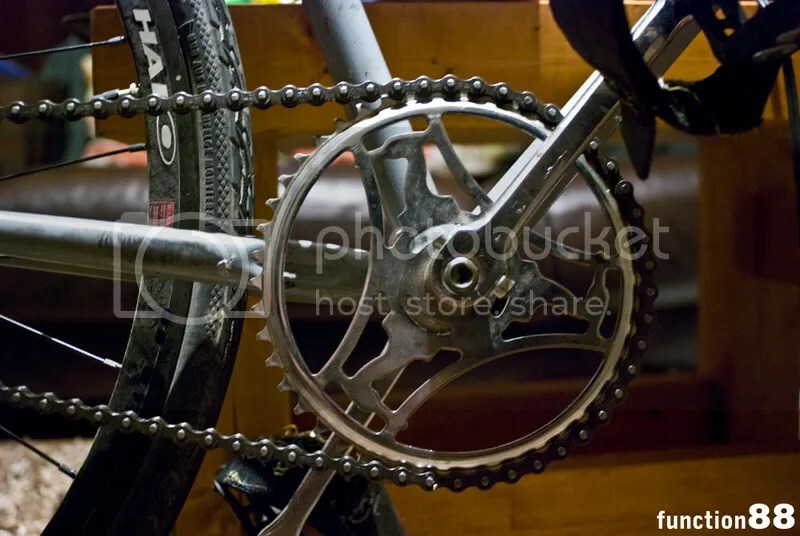 A single speed chain ring up front… with a cotter pin crank… Putting two and two together told me I should take one of these chain rings and put it on the fixie with a new, stronger chain and that’s exactly what I’ve done! 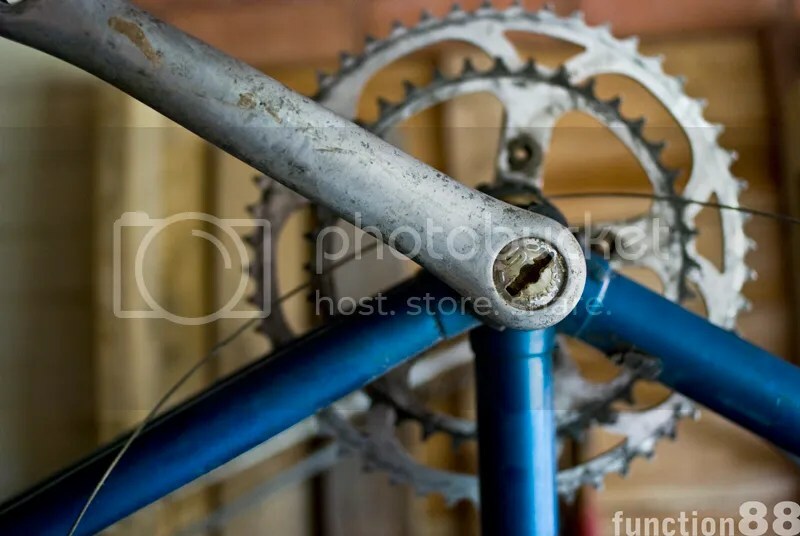 I had chose to take the chain ring off a very rusty Raleigh Wayfarer but my original technique of removing the cotter pins failed drastically and now I had two mushroomed pins holding the cranks to that bike. 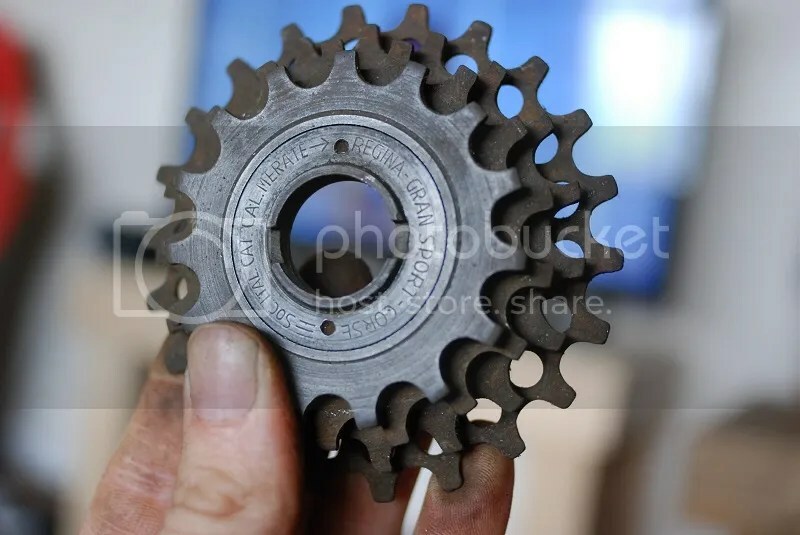 I found this guy on YouTube who has a channel dedicated to fixing bikes and watching a few of his videos gave me some ideas on how to remove the cranks. 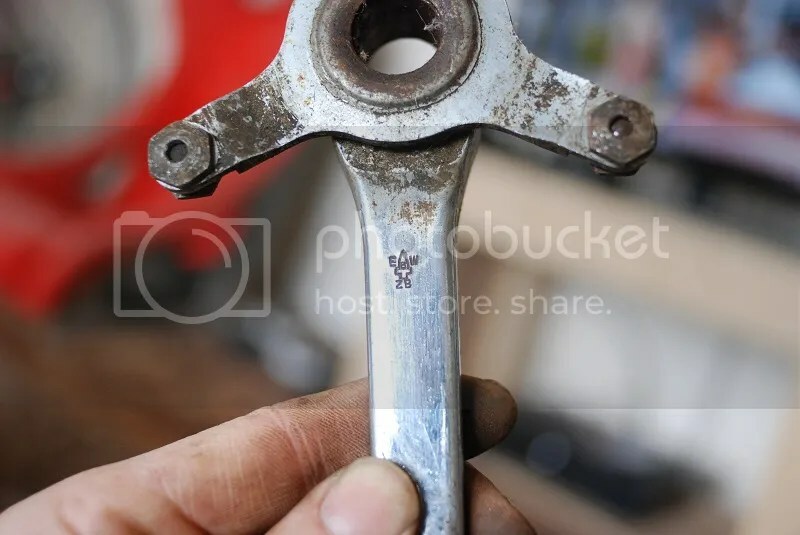 Low and behold, on another bike, I left the nut on the cotter pin, used a big punch on top of the nut and with one swing of a hammer the pin was free and I could swap the cranks over! 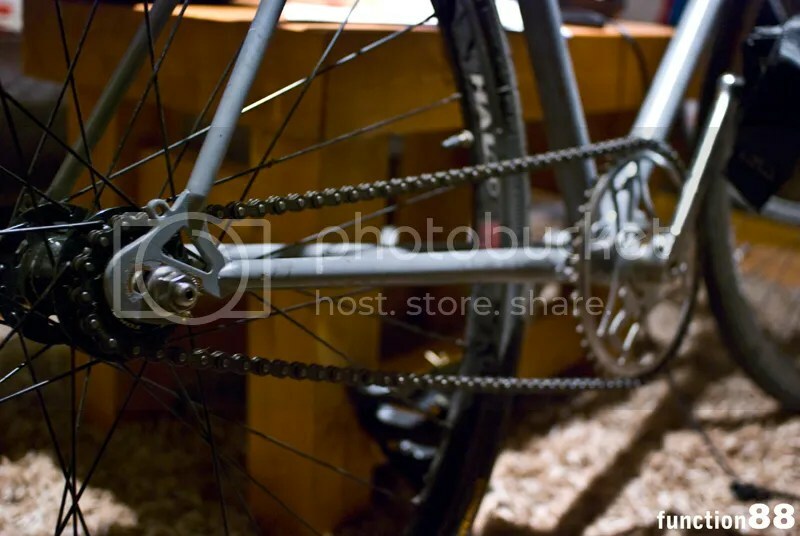 As for the chain, I decided to ditch the cheap Clarks chain I bought after only using it for 180 miles. 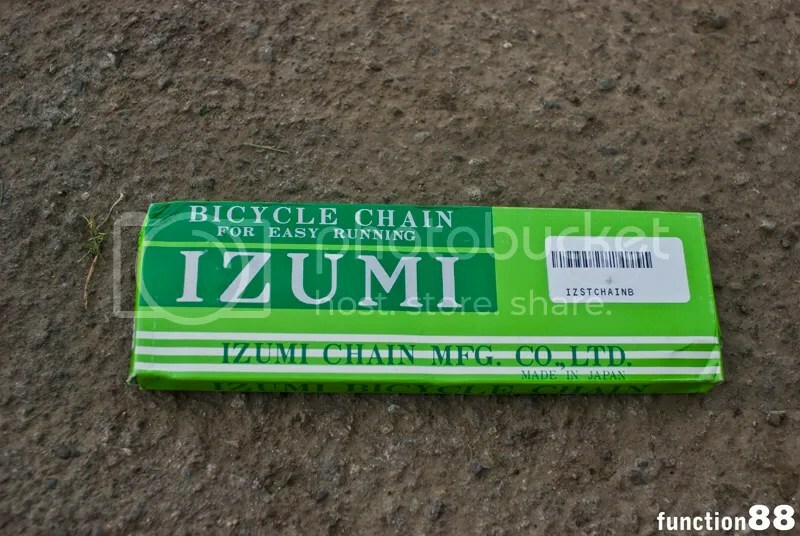 It felt so weak and it’s been nothing but trouble so I went for a Izumi chain this time. 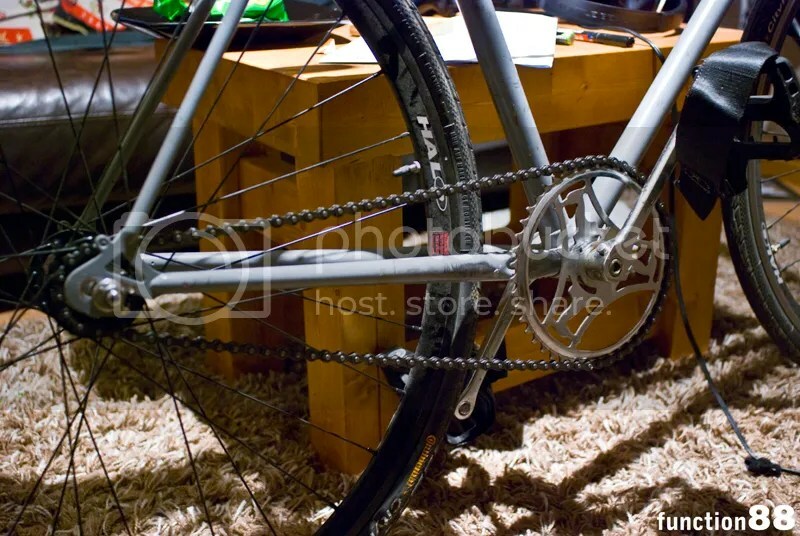 I saw it had good reviews on Chain Reaction Cycles and my first impression is it has a more sturdy appearance and feel than the Clarks chain. It looks solid, feels heavy duty and seems well made. 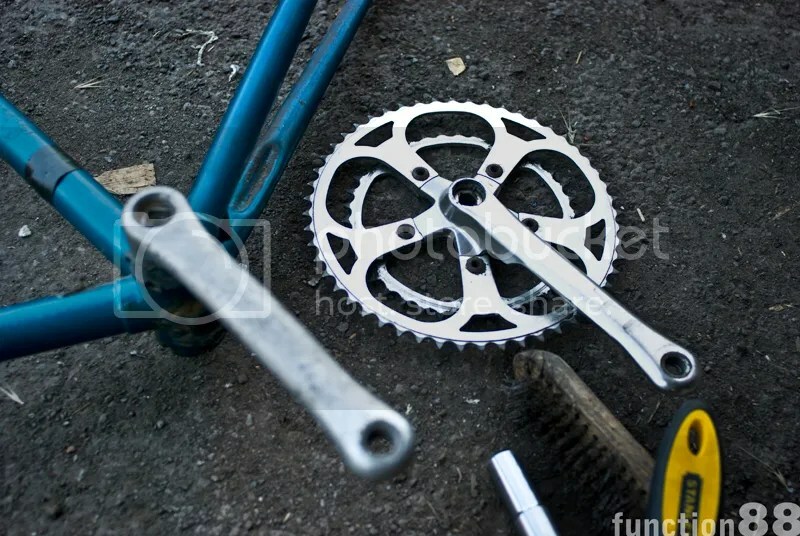 I had a slight problem with it being a bit big for one of my chain tools but it went on smoothly and rides well! Bikes! Who’d bloody have them?! Well I’ve finally got to work on the British Eagle I picked up a while ago. It didn’t look in the best condition when I collected it but it’s turning out to be an absolute nightmare! The bike was pretty much complete bars the wheels, saddle and front derailleur. 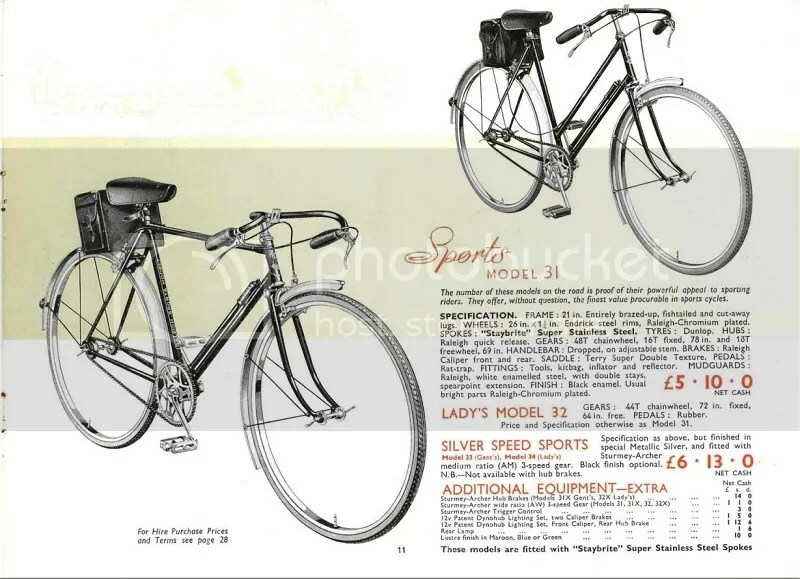 It had Shimano 105 brakes and gearing and an aluminium seat post, long stem and drop bars. 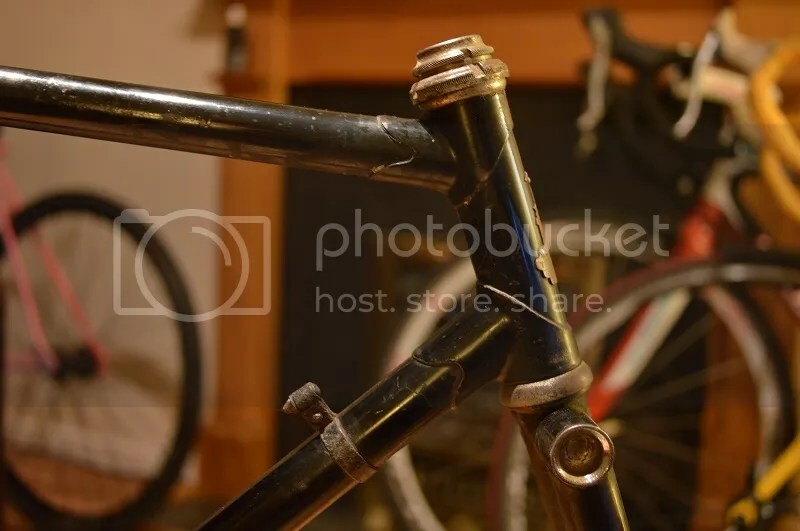 Google suggested the bike wasn’t too old but it had definitely been through the wars with parts of the frame repainting and bubbling but I still didn’t think taking apart would be this much work. 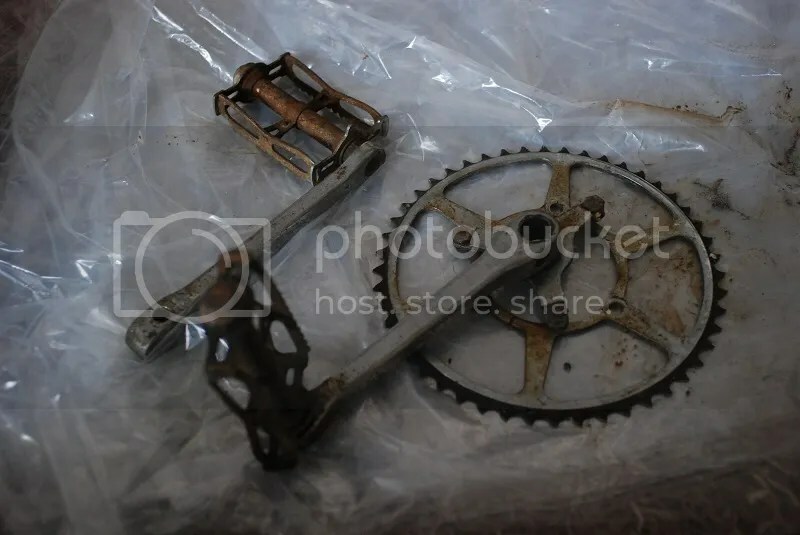 The brake system and rear derailleur came off really easily. No troubles there at all but as soon as I tried to remove the bars I realised I was in for a fight. 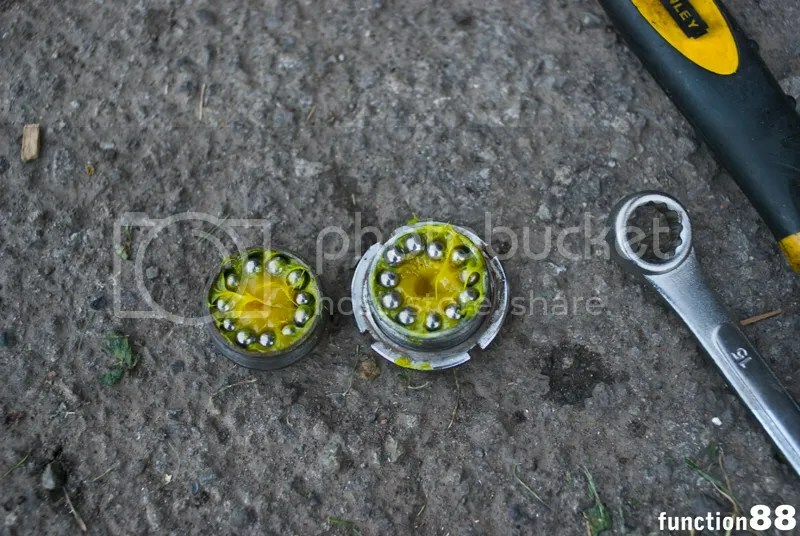 They were awkward but with a big screwdriver and a bit of wiggling I did get them out. 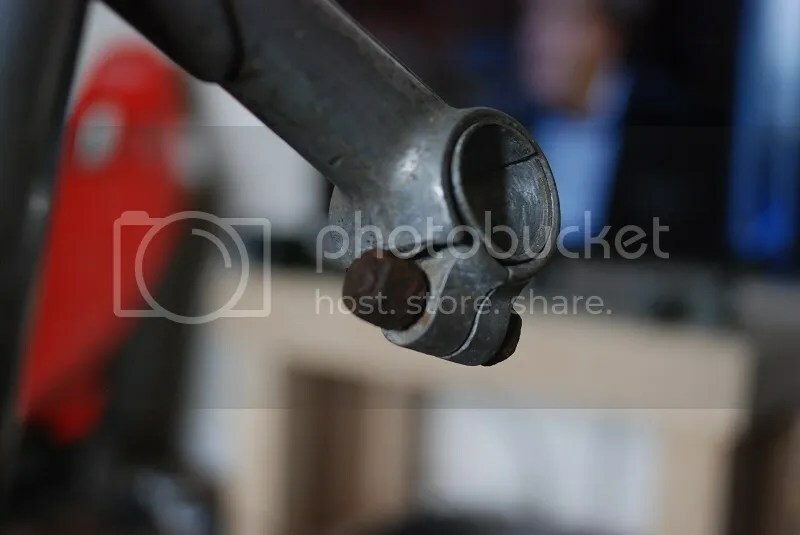 The seat post on the other hand, well that was stuck solid. 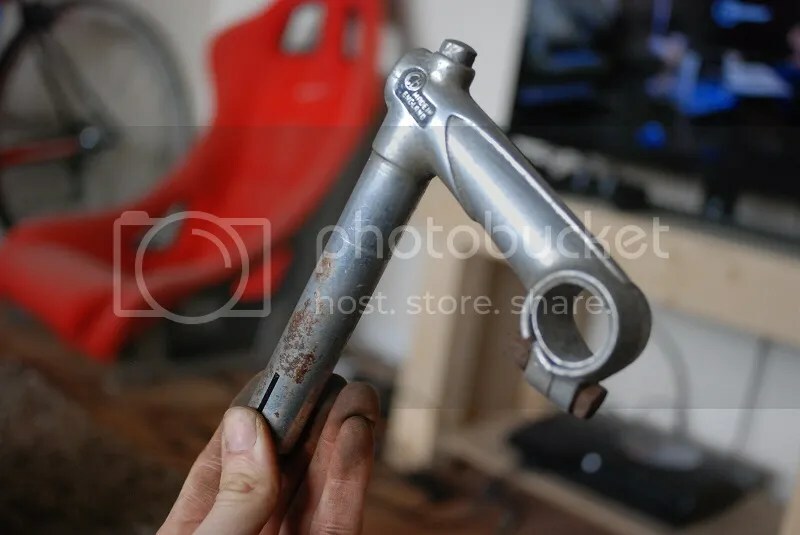 First I had to break through the paint that had been layered over the clamp and with that off I found the seat post wasn’t going to come out easily. 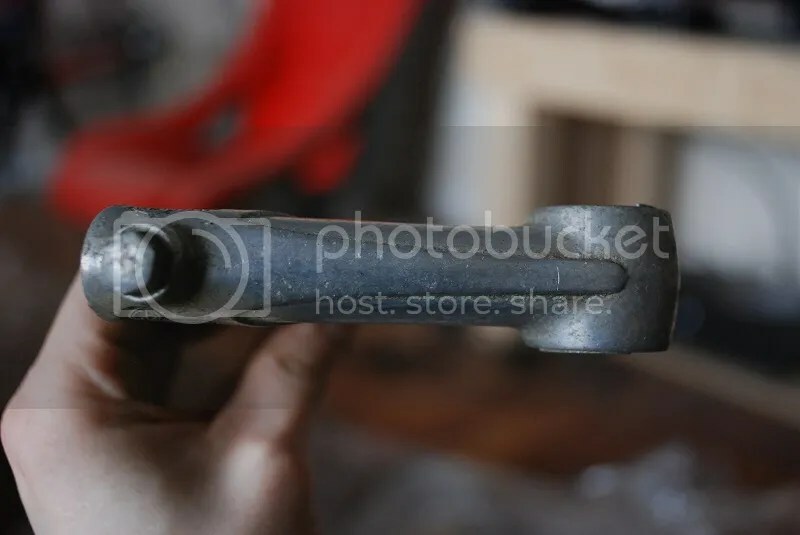 The entire length of the post inside the frame had oxidised and it took a lot of bashing with a hammer to free up. This unfortunately did damage the seat post slightly but I was pretty certain I could polish it up. Now this is where things have gone downhill. 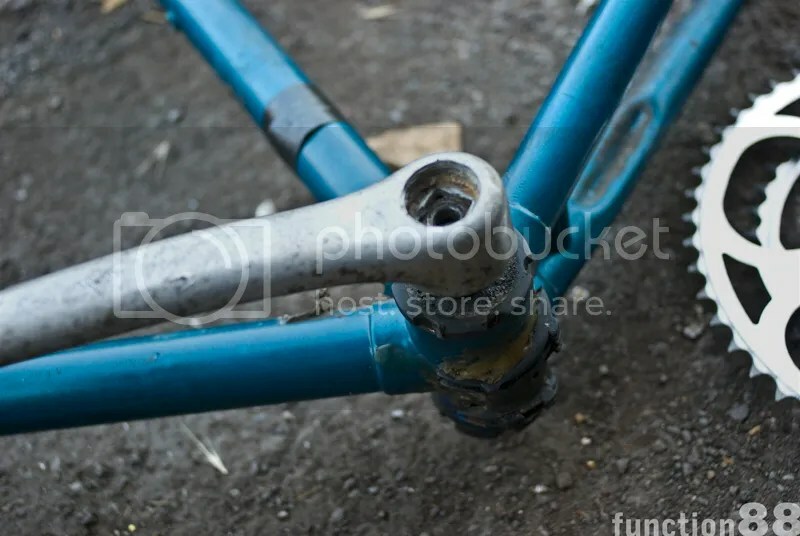 The seat post may have been difficult but the stem has been impossible and is now in several pieces. 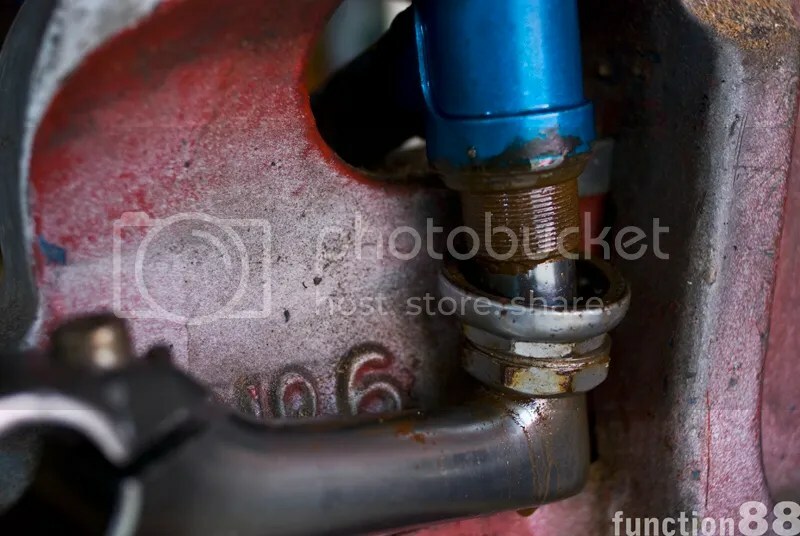 It wasn’t bolted down to start with but still it was stuck fast and the same method of persuasion that shifted the seat post (hammer) was completely ineffective against this. 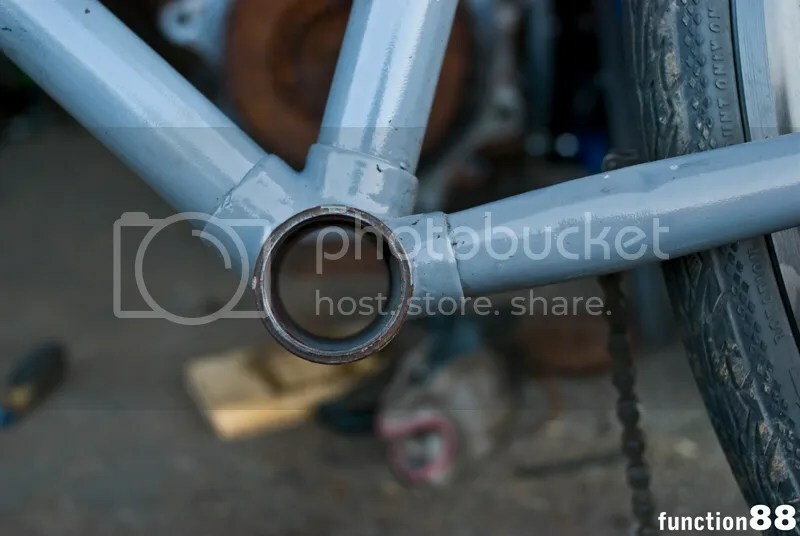 I’ve got a feeling it’s an aluminium stem and it has oxidised against the steel fork and effectively welded the two together. 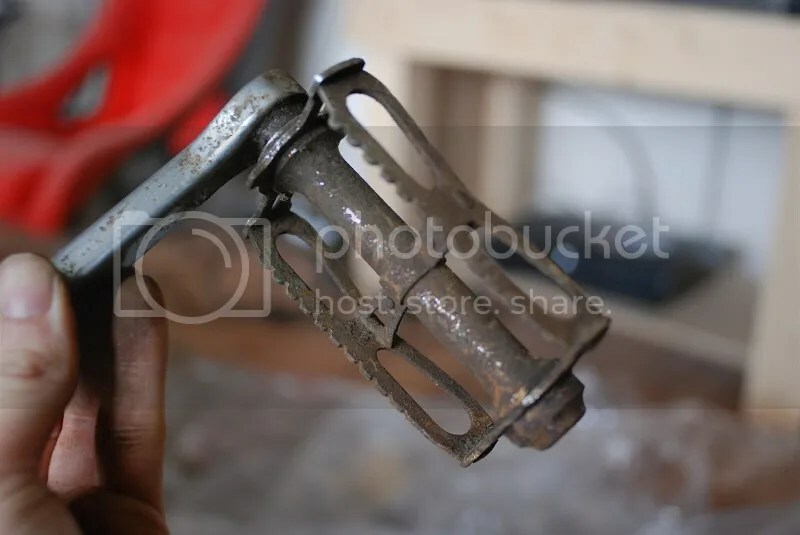 Turning to the old faithful penetration spray and giving it a good few coating and leaving it to soak did nothing so I tried heating it up with my blowtorch in an attempt to break the seal. Nothing. Not even a mm of movement and eventually the head of the stem snapped off. Not ideal but it gave me more of a chance to prise the remnants of the stem out of the forks… or so I thought. 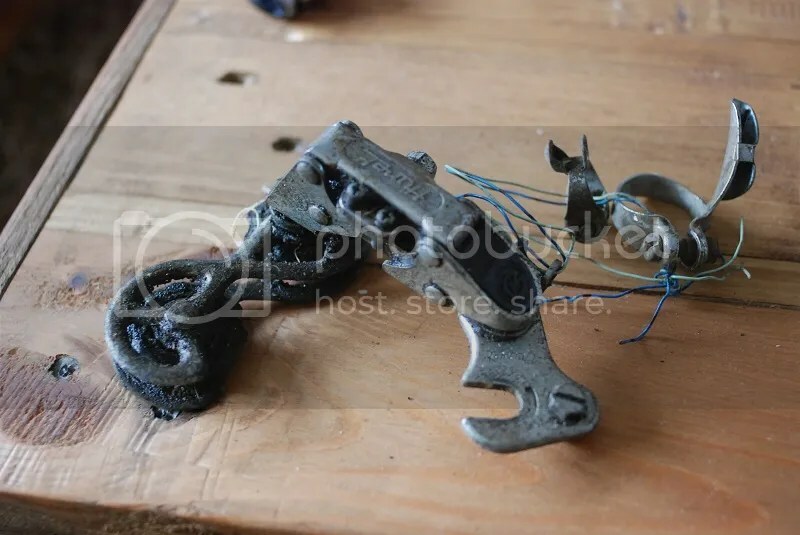 I tried gripping and crushing the broken half with my vice to no avail and I couldn’t even shift it with a punch an chisel. I’ve given up now. The forks have been damaged too and I don’t think they’ll be any good now. Maybe some BMX forks are on the cards now though? 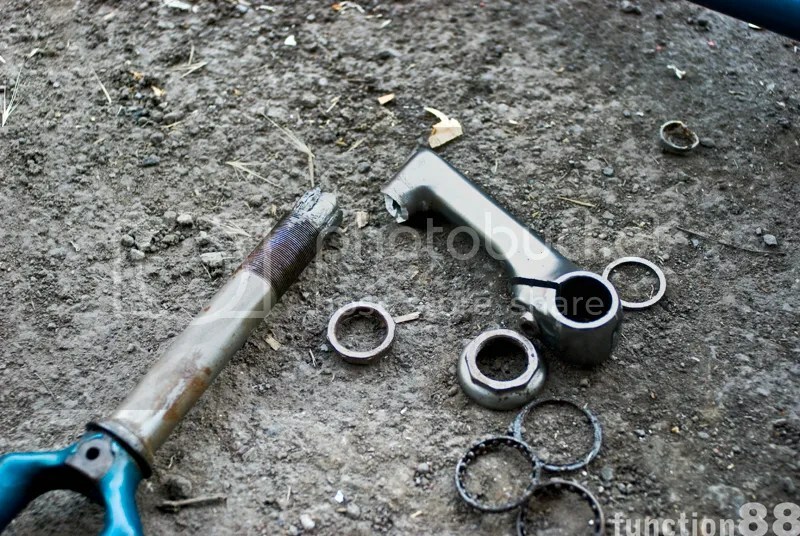 If I do manage to get this crank off… I’m still stuck with a strange bottom bracket. 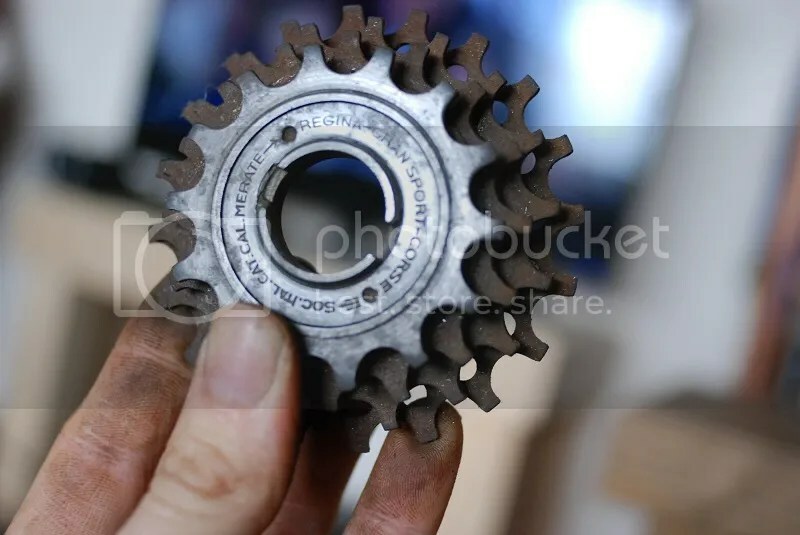 The cups / lock rings are made out of plastic and look like they need some form of C spanner to undo. 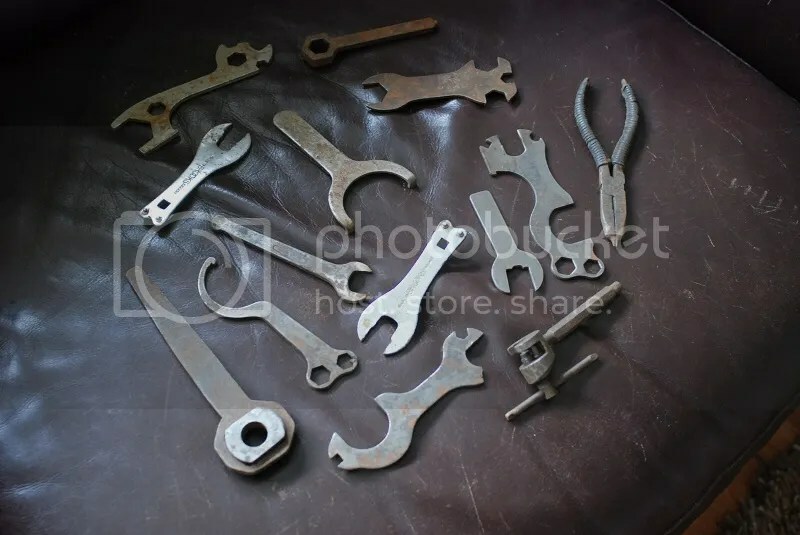 I’ve had a go at the drive side with a few tools but nothing worked so it looks like I’m going to have to find a special tool for the job. All in all, not the best start but we’ll see where things go from here…. Here we go, another edit. I’ve already seen some more things I want to try and recreate for the next “episode” but for now it’s more of what I tried out last week, as well as trying out the video in video part. 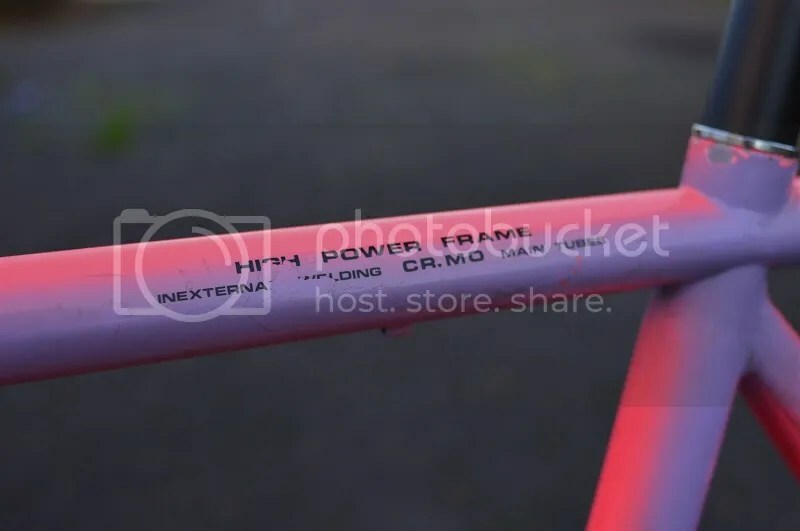 The first few clips, on the fixie… well that bike needs work again. I hit a drain cover and it knocked the back wheel out of alignment in the drop outs and jammed the chain and wheel. 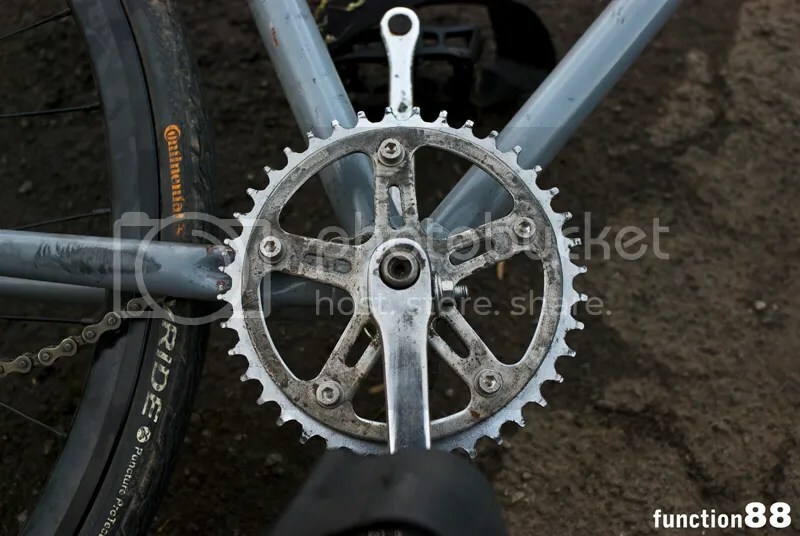 It didn’t stop me for too long but as I rode on I could hear some clunking and then the chain started to drop off again. It really does need a new chain ring… I went exploring on it though, following some back routes into fields, that was fun. After that is a bunch of clips from Cannock. I did another two laps of Follow the Dog and set a load more PBs but on the first lap I encountered major issues with my gears. I couldn’t really select anything mid range on the rear and kept on having to change up and down before it eventually just skipped constantly. Stopping to try and retension the cable on the trails did nothing so I stopped off in the car park after the first lap to check everything over. The hanger looked a bit bent so I “fixed” that and I retensioned the cable but it still didn’t work. I ended up doing that lap with either 9th or 1st on the rear. It really was go fast or go home!